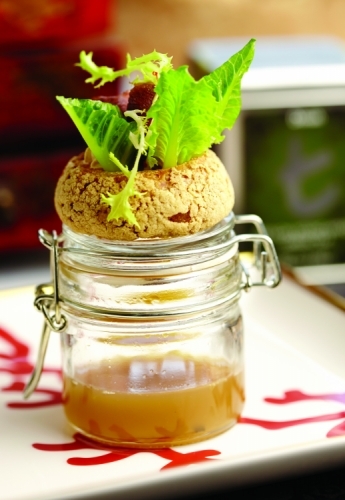 To flavour the meat smoke the cured duck breast with Dilmah Ceylon Green Tea. Once smoked slice the meat and roll. Mix together the paprika and sour cream, check the seasoning. Arrange the rolled meat and mix cress. Make the choux bun in to a sandwich. Roast the duck bone and cook together with mirepoix to make the stock for consommé. Infuse the consommé with dried lavender for aroma.